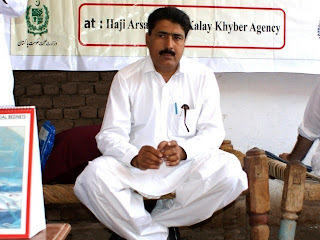 Those intellectuals and journalists who kept silent over the arrest of Dr. Afiya Siddique and Dr. Ghulam Nabi Fai, now their restlessness over the arrest of Dr. Shakeel Afridi is beyond understandability. It seems if they had power they would have sent Dr. Shakeel with full protocol to the US embassy. They are unable to give arguments to prove Dr. Shakeel as hero of the modern era who played a vital role in the arrest of the great terrorist and saved the mankind from destruction. 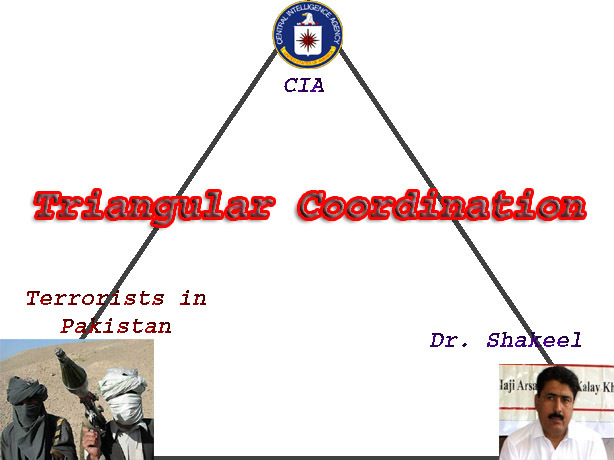 In contrast to this American organizations of doctors are not only condemning Dr. Shakeel but CIA as well. They are of the view that Dr. Shakeel has put the lives of people of Abbottabad and innocent children by defaming the profession of medical. Because these people and innocent children have been left for hepatitis after giving them only single shot of Hepatitis-B vaccine, while it consists of three shots. According to the international organizations of doctors, Dr. Shakeel has committed a very grave crime against the HIPPOCACTIC OATH. This will be only realized by the nation when these innocent will be suffering with this grave disease for which they have been only single shot of adulterated vaccine. 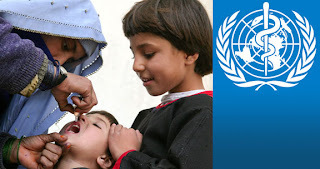 The second damage to health department in Pakistan will be that many people in the tribal areas are against the Polio vaccination, now the treachery of Dr. Shakeel has provided them a strong evidence for supporting their claims that the purpose of vaccination in Abbottabad was not to protect the lives of people but to earn money through working for American terrorist agency CIA, thus Dr. Shakeel has wasted all the efforts and campaigns of NGO’s and other different programs of UNO. Who will trust these WHO vaccination campaigns? International organizations regard 33 years imprisonment as JOKE for crime of Dr. Shakeel. According to them the crime of Dr. Shakeel in which he utilized his profession and degree is so grave that he should be punished in such a way to set an example. 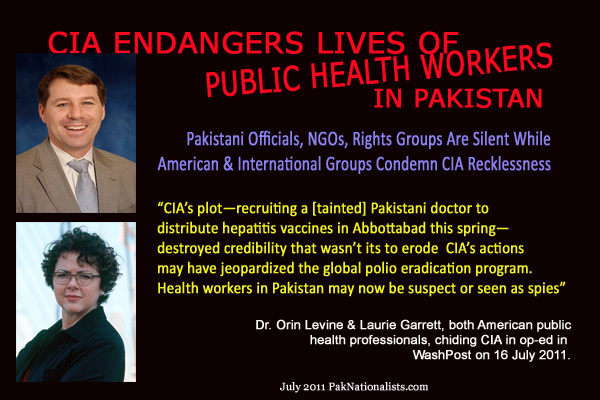 These organizations have demanded that Pakistani doctors should protest against Dr. Shakeel and USA, because this is the demand of their profession otherwise CIA will continue using them for its damn plans. Condemning CIA international organization of American doctors in New York has said, “If china uses American doctors and fake vaccination to kill wanted terrorist As’ad Abu Khalil Poses (under protection of USA) and succeeds in murdering him than what would be the reaction of American public, media, civil society, doctors and American govt. ?” In the same way if Iran utilizes same method which has been used by CIA to kill members of IRANIAN TERROR GROUP MeK under the protection of America being used for murdering Iranian nuclear scientist, then how would Americans feel? In a statement condemning CIA this question has been raised that if a Cuban oriented Dr. succeeds in murdering ORLAND BOSCH head of CIA BACKED ANTI-CUBAN TERRORIST GROUP by putting the lives of hundreds of innocent American children through a fake vaccination campaign than how will US govt. treat this doctor? Will he be imprisoned for only 33 years? If this is so than the doctor and his family would be lucky. Here I would like to discuss American Marine BRADLEY MANNING, a 23 year old American, under what allegations he has been arrested that he is expected to be sentenced for a life term. He has not disclosed American military secrets or murdered someone or committed any other grave crime, than he is under trial? Just for that he disclosed American state terrorism and war crimes to the world due to the call of his sub-conscious? Why he is under trial in American court? Does not charter of UNA or Geneva convention clarify the rules of war? If army of any country violates these rules than what is the evidence behind trial in the international war tribunal? America should be thankful to his soldier who by disclosing war crimes and state terrorism of his colleagues under the international laws provided an opportunity to American army to identify psychos with in their force and improve its credibility? In the other word BRADLEY MANNING has helped not only UNO and USA but humanity by unveiling the criminals like Dr. Shakeel. But this will never happen because the list of American war crimes in Iraq and Afghanistan is so long that if we make a list of those soldiers/terrorists of American who get pleasure through torturing or murdering innocents than more than half of the American state terrorist army would be sent to prisons. Whether it is American stance over Dr. Shakeel or arrest of Dr. Fai, the double standards of American establishment show that American mindset is of a fascist. Whether these are democratic values or human rights America should confess that she does not care for any of them because she is mighty and powerful. In fact America believes in fascism thus who ever dares to challenge damn American plans or interests he has no right to live and remain in this world. As long as imprisonment of Dr. Shakeel is concerned, according to the story published in daily Dawn on 30 May, 2012 he has been sentenced for imprisonment for his links with a terrorist group of Lashkar-e-Islam and for his medical services which he provided to head of this terrorist group i.e. Mangal Bagh and other injured terrorists. In this way the links between CIA and Dr. Shakeel and links of Dr. Shakeel with terrorist groups make such a triangle that no doubt remains that whether it is Lashkar-e-Islam or other terrorist groups they are indulged in terrorism in Pakistan through the support of American terrorist agency i.e. CIA and USA (United Satanic Alliance).